The Institute of Marine Sciences (IMS) is an internationally known marine station providing high quality marine research and teaching, and has remained at the forefront of marine biology for over 70 years. The research conducted at IMS is by nature multidisciplinary, reflected by strong links between the School of Biological Sciences and the University of Portsmouth Environmental Network (UPEN), the Department of Geography, the School of Earth and Environmental Sciences and the wider research community. 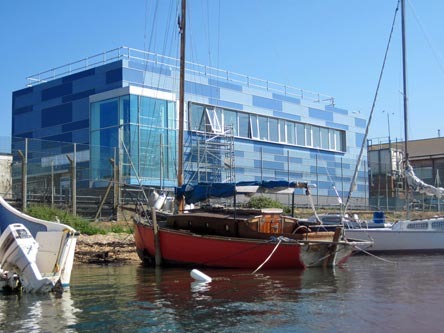 IMS is located within metres of the sea providing access to the varied marine ecosystems of the Solent European Marine Site. The new £2 million aquarium and laboratory suite adds to the extensive facilities available to marine biology researchers and our postgraduate and undergraduate students. The IMS owns a fully marine, floating research platform permanently moored in Langstone Harbour, which is used for exposure trials and a range of in situ research and monitoring. The RV Calypso, our 5.4m research vessel, is available for inshore surveying. Portsmouth University is a training hub for the Capturing our Coast (Cocoast) Project. Cocoast represents a unique collaboration between a wide range of organisations concerned with understanding and conserving marine biodiversity.